1. Season your Shcweid & Sons The C.A.B. Custom Blend: Chuck Brisket Burgers with kosher salt and place on flat top grill at high heat. Cook to order (medium rare will create a juicier bite). 2. Slice tomato and pull leaf lettuce into individual leaves. 3. 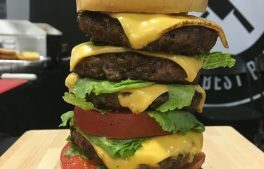 When Burgers are almost done, place slices of American cheese on select Burgers and allow to melt. 4. 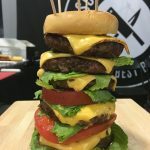 Build your finished Burger as follows: Martin's Potato Roll, lettuce, Burger, cheese, tomato, lettuce, Burger, cheese, lettuce, tomato, Burger, cheese, lettuce, Burger, cheese, lettuce, Burger, cheese, Martin's Potato Roll.